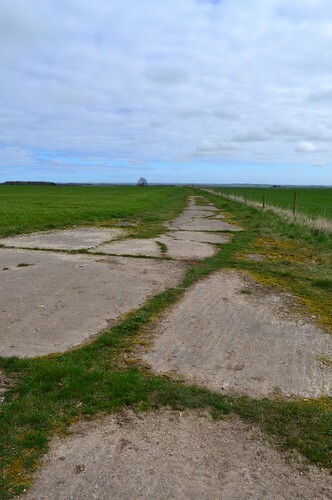 Up in the Yorkshire Wolds stands an airfield that could have been considered as one the Air Ministry’s ‘less sensible’ decisions. 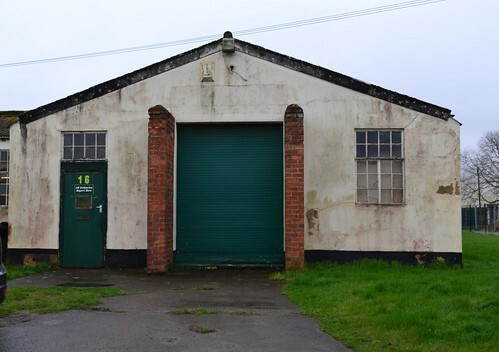 Open to the elements, this site was built but never fully used by an operational flying unit, in fact, Cottam could be considered one of the RAF’s more expensive bomb dumps, used primarily for munitions storage toward the war’s end. 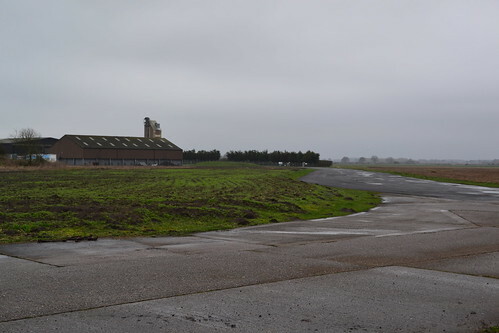 In its construction it would have accommodation, a hangar, and a watch office, along with three concrete runways – all the makings of an RAF bomber base, yet it was often desolate and empty. Even though it wasn’t used operationally, it did have its own problems however, and its own casualties . 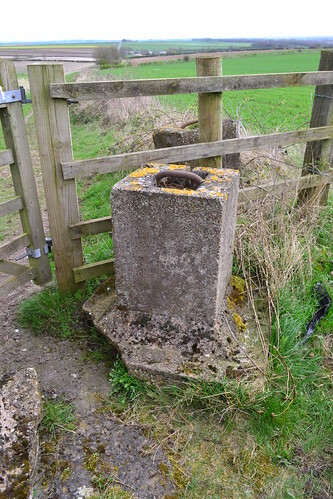 Trail 40 takes us across the River Humber into the East Riding of Yorkshire, where we visit a number of former airfields. The first is the former RAF Cottam. Designed originally as a satellite for RAF Driffield, Cottam airfield lies high up in the hills on Cottam Well Dale, about 5 miles north of Driffield, just a stones throw from the village of Langtoft, and the tiny parish of Cottam. At 475 ft. above sea level, it is one of the higher peaks in the area which makes it popular with dog walkers and ramblers alike. 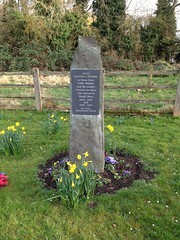 The airfield site encompasses the site of the ancient village of Cottam, (on maps of the late 1600s it appears as Cotham) of which only the church remains. 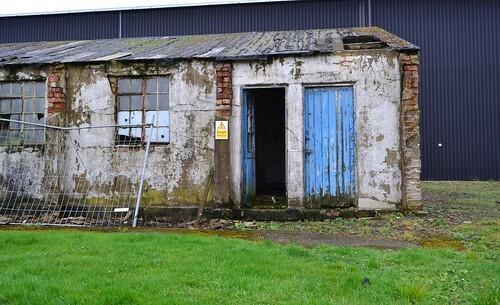 A lone building, it stands neglected and derelict, a reminder of a small community that has long since gone. 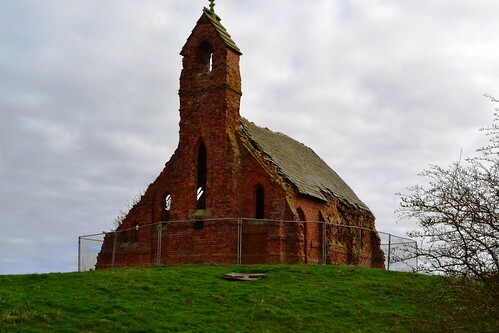 The abandoned medieval church marks the boundary of Cottam airfield and a community long gone. 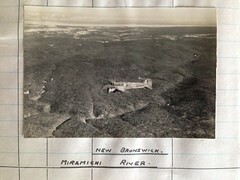 The Air Ministry decided to build an airfield here to be used as a satellite and possible bomber base. The airfield would have a watch office with detached operations block (the separate block designed to drawing 13023/41). 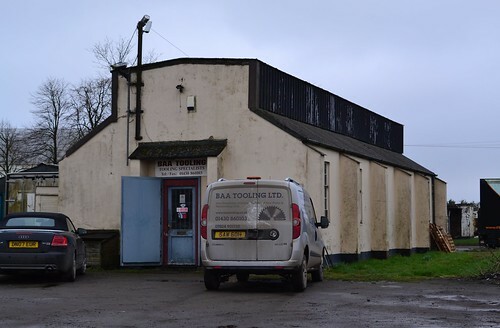 As construction was completed before June 1941, it would be classed as a Type ‘A’ building, and would need to be modified to bring it up to the newer Type ‘B’ standard as were being built on later airfield sites. Under the Type ‘B’ scheme, Cottam would have a Watch Office built to design 13726/41, then adapted by the fitting of smaller ‘slit’ windows more in line with bomber and O.T.U. satellite airfields of that time (15683/41). Sadly, the entire building was demolished in 1980, and no there are no signs of its existence left on site today. 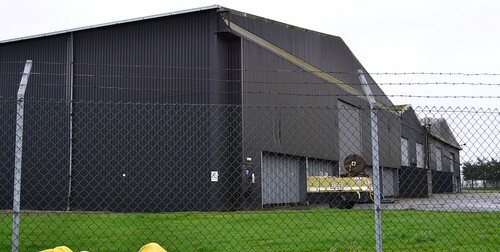 A single T1 hangar provided space for aircraft repairs and maintenance, and accommodation, although sparse, would accommodate around 1000 men and 120 women of the Maintenance Command by December 1944. 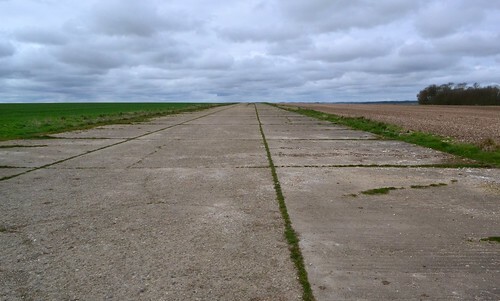 The remains of the secondary runway looking west. Cottam officially opened in September 1939, and as a grassed airfield, would only be used for dispersed aircraft from Driffield’s 4 Group Bomber Command, flying Whitleys of 77 and 102 Sqn. Cottam was also used later on for the Fairy Battles of 4 Group Target Towing Flight (4G T.T.F.) 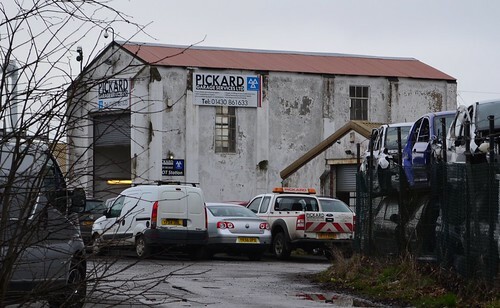 also based at Driffield at that time. It wouldn’t be long though before Cottam would have its first accident. On July 1st 1940, a dispersed aircraft, Whitley V, (N1391) ‘DY-H’ of 102 Sqn, swung on take off causing minor damage to the aircraft. 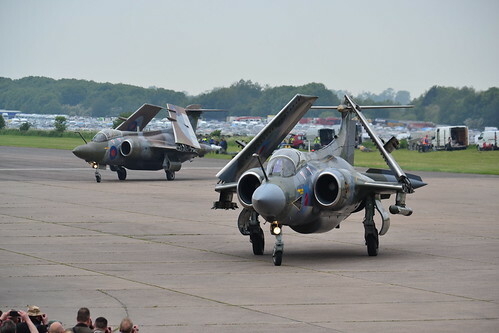 Luckily there weren’t thought to be any casualties in the incident, but the aircraft was rendered unable to fly, and the damage was sufficiently serious to need it to be taken away for repairs. A month later, the 15th August 1940, signified a major point in the Battle of Britain, one which saw all of the Luftwaffe’s air fleets deployed for the first time, in a full and coordinated attack on the British mainland. This day saw the heaviest fighting of the Battle with attacks ranging from the south coast to east Yorkshire, and up to Edinburgh. This also meant the start of a number of attacks on British airfields and Driffield would not be left out. 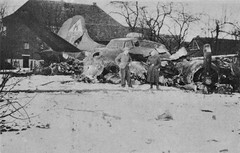 In this first attack, a Luftwaffe force of some 50 Junkers Ju 88s attacked the airfield damaging or destroying 12 aircraft on the ground – many of these were Whitleys. This attack was particularly devastating for a number of reasons, one of which was that it caused the first death on active service of a Bomber Command W.A.A.F., (A.C.W.2) Marguerite Hudson, who was killed after delivering stores to the site. 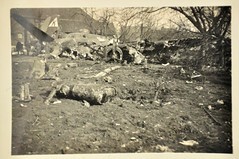 This attack caused extensive damage to both the airfield site, infrastructure, and aircraft, and for a short period whilst repairs were undertaken, some aircraft were moved and dispersed here at Cottam. Indeed, on 27th September 1940, 4 Group T.T.F moved over to Cottam where they stayed for a month, not returning until the 24th October, once repairs had been completed and air attacks had all but ceased. The secondary runway looking east, this part is full width but built upon. 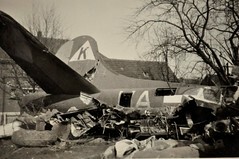 It is possible that these attacks may have led to the demise of one 77 Sqn Whitley V (N1355) ‘KN-X’ flown by Sgt. James Walter Ward RAFVR (741435), who undershot on landing at Cottam, hitting a fence, causing the undercarriage to later collapse. The five occupants of the aircraft were unhurt, but the aircraft itself was later struck off charge on 22nd September 1940, after assessment at Armstrong Whitworth in Baginton*1. Ward himself was killed with his crew only five days later, when his aircraft, Whitley V, (N1473) was shot down by flak over Noord Brabant, 2km from Vijfhuizen, on September 25th 1940. He died along with P/O C. Montague, himself a veteran of three previous serious crashes. By the end of August 1940, both 77 and 102 Sqns had departed Driffield and so Cottam, which left it only being used by the Fairy Battles of 4 G T.T.F. During the winter months Cottam was abandoned by these aircraft, presumably due to its inclement weather conditions, but dispersed aircraft did return again in the spring and summer months. 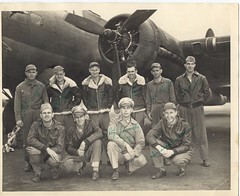 In October 1941, 4G T.T.F. reformed at Driffield as 1484 T.T.F., and it is at this point that it is thought their use of Cottam ceased. The perimeter track looking east. The main airfield is to your left. Under the Ministry’s airfield expansion plan, new airfields of the early 40s were built with concrete surfaces. ‘Older’ grass sites, like Cottam, were upgraded having new runways laid down in an effort to reduce water logging and provide a more stable surface for the heavier bomber aircraft coming in. To meet these upgrades Cottam’s three runways – all consisting of concrete and wood chip – were built; the main being just short of 5,300 ft., with the two further runways around 4,000 ft. in length. Pan style aircraft dispersals were also added which gave Cottam a new look and hope for the future. However, and even though huge amounts of money had been spent on the airfield, it was decided it was not to be used further, as either a satellite or a bomber station. Cottam was offered to various other military groups who all turned down the location for various reasons. The army did take up residency for a short while until March 1944, whereupon it was then used to store vehicles for the impending invasion of Normandy. Blocks from the former site, and the beautiful views across the Wolds from one of the highest peaks in the area. It is believed that further forced landings took place at Cottam during this time. 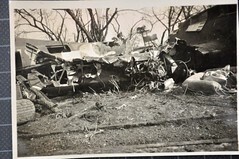 Firstly, a damaged B-24 ‘Liberator’ came down after sustaining damage on a raid; and secondly, it is also thought that a Halifax landed here after an S.O.E. mission. Sadly at present, I can find no further official details of these events, and cannot therefore expand on them further. Toward the end of the year 91 Maintenance Unit (M.U.) 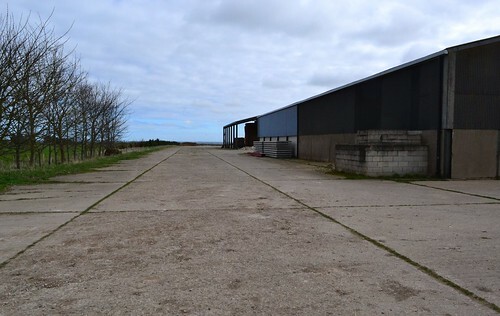 were based here*2 using the runways and hardstandings to store ammunition and other stores that were delivered by road from the rail yard at Driffield. A spell of residency for 244 Maintenance Unit carried on the storage work before the airfield was finally abandoned and closed in June 1954. Returned to agriculture, the airfield is mostly gone, a section of the easy-west runway does still exist, and in part, at full width. 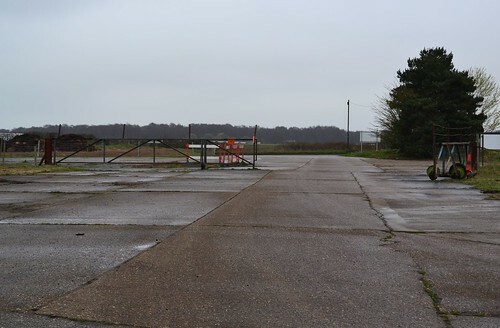 Footpaths allow for walks across the site allowing views along the runway in both directions, they also allow walkers to use the remains of the perimeter track and secondary runway – albeit as a track. 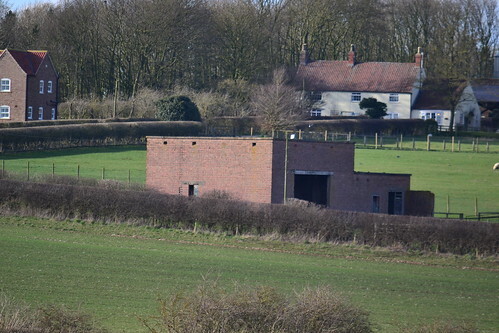 The frame of an air-raid shelter, an accommodation building and the standby set house (designed to drawing 13244/41) are in situ, although by far, the runways are the most prominent feature surviving today. The Stand by Set House stands today. Access is best made from the Cottam Lane junction. The path leads up through the site of the medieval village of Cottam where the church still stands. This takes you south onto the airfield site itself and along the two runways. The walk extends along the perimeter track to the south, where debris from the perimeter track can also be seen. Built high on the Wolds of Yorkshire, it is hard to understand why such a site was chosen. In winter, it could be bleak, windy and very cold. Landing conditions must have been difficult at best, and treacherous at worst. Its history of accidents tell their own tale. After visiting Cottam, visits could be made to a number of former sites, e.g. Full Sutton (now a prison), RAF Driffield (driver training centre), Pocklington and Elvington (an excellent museum). I shall add these later when I have returned to Yorkshire. In the meantime, we turn south-west and head for another former RAF station, this one though had a great deal of use, from the beginning of the war right up to the 1980s. This airfield started off as a bomber airfield in the early stages of the war. 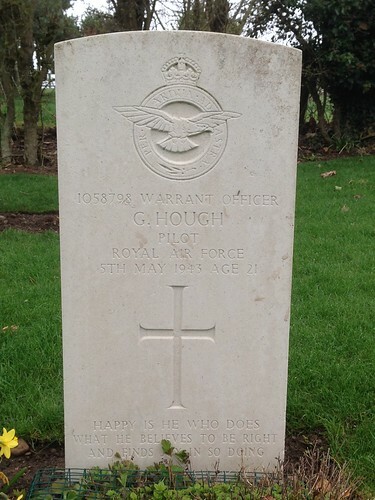 As Bomber Command operations grew, so did the airfield, and so too did the casualties rise. 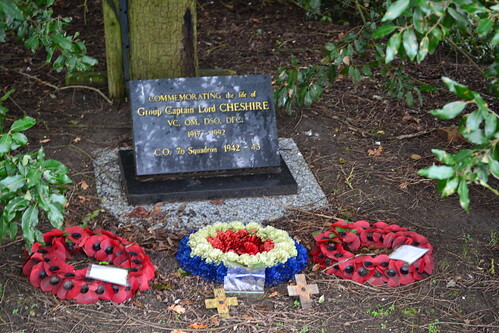 Source and further reading: RAF Cottam. 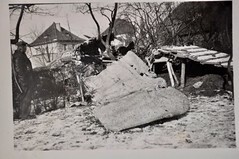 *1 This was reported on a number of sites (Air Safety Network) but no records could be found referring to the accident in the Operational Records Book recorded by 77 Squadron at that time. *2 See the National Archives website for details. *3 News report on the proposal. The Hull and East Riding at War Website has a range of information on the area during the Second World War. My thanks go to Ronnie and Jo for the great walk, and for being such fabulous hosts. Sources and further reading: RAF Holme-on-Spalding Moor.